A newspaper heading says in a large serif font: Netflix Forced to Pay Comcast. “They send us many GB. We send them very few. It’s not fair to us.” -- Comcast. The next panel shows a man with a pointer standing near a microphone and a lectern. On the screen behind him a diagram shows, with arrows, the flow of both "GB" and "$" from Netflix to Comcast. Man with pointer: The money follows the traffic. It’s only fair. The next and final panel shows a similar scene. 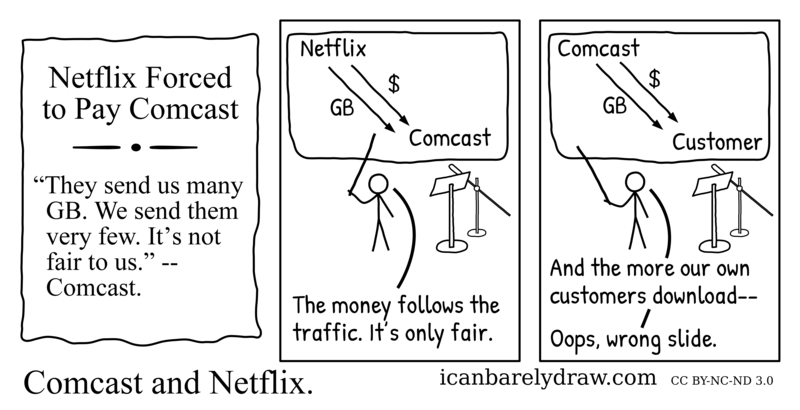 The screen now shows the flow of both "GB" and "$" from Comcast to Customer. Man with pointer: Oops, wrong slide.